There is a popular marketing practice based on customer personas. The approach defines simple customer segmentation by demographic descriptors, and then essentially targets like groups with tailored messages. Full disclosure: I was never a believer. The underlying assumption in persona-based marketing tactics is that every “Professional Urbanite” shares the same interests, values, and spending habits. To me, this never seemed plausible. The approach also lacks dimension and life. What if a city-dwelling attorney went to the gym every day? Or struggled with weight issues? What opportunity could that insight create? This approach, though still relied upon by many marketers, provides a static, flat façade—it’s a convenient shorthand. Even if personas are still in use today as a jumping-off point, let’s remember that in the past, marketers had only milestone event data to draw from: Messages sent, inquiries, responses, purchases, amounts of discount and spend, etc. It was that behavioral data, limited as it was, that provided the true insights to needs, interests, spending habits, and value. Today, we have so much more information at our fingertips, which makes what we do and how we can do it infinitely more effective. The advent of Big Data has changed everything for marketers and reliance on customer personas in the manner they were used in the past is changing. Customer interactions with a brand are tracked pretty much anywhere, and all the time, and as a result, marketers have a wealth of behavioral data at their fingertips. That data is the abundant raw material for true customer intelligence. But too often, marketing is not based on customer intelligence derived from that data. Rather than marketing, we get regurgitation: Phantom images of previous page views. This practice is based on another tragic assumption: A View = Purchase Intention. That’s a big leap, and oh so inaccurate. This is the reason we customers (and aren’t we all customers?) are continually bombarded by disconnected marketing messages, all making us regret the fateful click that results in being haunted by a pair of shoes that aren’t even available in your size. This tactic only factors one disjointed point in time: The event of a click. There is no understanding of the past, and no projection of the future. There is no reflection of prior behavior, cumulative intelligence, or real understanding. This is the new static façade, the new shorthand. The tactic also puts companies in perpetual customer acquisition mode. They use a slow beatdown to squeeze the most value from a single transaction. And then must achieve that same objective again and again—if and when the customer returns. I’m picking on this tactical digital practice for the lack of customer intelligence, but it is true for other channel marketing as well. Emails promoting products not remotely of interest, websites that return heaps of unrelated search results, direct mail for memberships already purchased, and on and on. What these tactical message assaults evidence is neglected customer intelligence, either of outdated demographic grouping or richer behavioral intelligence. When companies kitchen-sink their messages or practice the slow beatdown, they expect customers to select, from among the thousands of impressions delivered every day, the ones that matter. And that expectation is so unrealistic. Brands, often unwittingly, expect customers and prospective customers to review, process/understand, assess, compare, determine the credibility of the company and the appropriateness of the product/service to the problem in need of solving—all to be rewarded by the opportunity to spend their money on a company’s products or services. What a terrific deal! And what a lot of weight to place on customers’ shoulders—and a lot of risk to assume. Forrester cited a statistic in 2013 that should have prompted a transformation: Prospects are 75-90% through the decision cycle before contacting sales. For every company that does not create customer intelligence and instead relies on its customers to do their work, that transformation will not happen. When we have so much available behavioral data, all the raw materials to reflect true customer intelligence, why do we make customers do the heavy lifting? A likely explanation is ease. It is simple and quick to rely on untargeted, mass messaging through whatever channel, all with the objective of maximizing a transaction—and technology makes it easy. There are costly tradeoffs for the spray-and-pray simplicity that makes customers work to spend with us: Customer engagement, loyalty, and optimization; competitive advantage, cost, revenue. In the days when limited event data was available, customer behavior was visible. That was because companies controlled both information content and its distribution—where and when and how and to whom. Customers were wholly reliant on companies for product and service descriptions and pricing information, and had to piece together their own comparisons. Now, information is everywhere, all the time. Customers may turn to third parties, competitors, social media, their peers, and old-school word-of-mouth product and service insights. The challenge for today’s companies is that those interactions are invisible. A company knows when a customer is on their website, calls customer service, or does a live chat. But that company cannot see or track or measure or analyze interactions taking place outside their ecosystem. Suddenly, there are impediments to appreciating interest or progress. Customers appear, disappear, and then reappear—or not. This creates voids in customer data, and a challenge to create actionable customer intelligence. Applying the same historical comparison, when companies controlled information, they also could track linear progress. Movement through the traditional sales funnel was the method that companies used to track customers’ path toward purchase. Now, customers chart their own journey, and that journey may not always be logical, or forward, or reliable, or steady. Now customer behavior is non-linear. Because companies can no longer control a linear process (often companies don’t try to manage or influence it), customer intelligence becomes even more important. Absent that intelligence, companies are only able to market to the isolated customer interaction. Therefore, companies rely on the digital specter, the untargeted email, or spray and pray. Again, it is as if nothing came before, and there is no projection for what will come after. We are awash in data and simply don’t know how to apply it. Once companies controlled the content—and therefore the impressions—of their messages, positioning, pricing, and discounts, etc. Now information is everywhere. Companies can no longer reserve information for later in the buying cycle, or to close the big sale. When starred reviews are presented with product information, customers get an immediate value impression before they have even read the description. When other consumers post comments, questions, reviews, photos, or experience videos, customers have an opportunity to preview their purchase bundled with a stranger’s opinion and experience. When customers request recommendations on social media, word-of-mouth is digitized and amplified. All these sources of information have an outsized effect: opinions are now crowd-sourced. As customer behavior is now non-linear and often invisible, it is necessary to identify key behaviors. This is an analytic exercise that should highlight critical interactions. From there, significance must be determined. For example, I did an analysis of customer behavior on a client’s website. For one customer segment, viewing the price page was the first and most significant step as many dropped immediately thereafter, assumedly because they were price sensitive. For another segment, viewing the pricing page was the last step following a long learning investment. Both groups took the same step: They viewed pricing. Taken in isolation, it would have been easy to haunt both with product images. For one group, the fate was sealed, for another, the practice could potentially alienate, since a decision was likely made. Once key behaviors are identified, they should be linked together. The objective here is to create a sequence. Companies must necessarily compensate for non-linear behavior and voids in information by stitching together key moments of interaction. 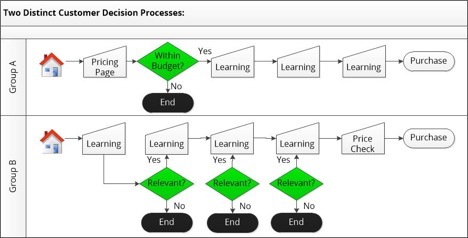 It is the only way to use data to create meaning, and understand progress through the decision cycle. The sequence is singularly important in understanding how to best serve each of these groups. To decrease the number of Group A that dropped after viewing price, value and ROI was added to the pricing sheet. To better support Group B, the information pages were examined for content, ease of use, and transition. Because customers leave a data trail everywhere all the time, they expect companies to know them. There was a time when companies could afford to have a siloed, myopic understanding of the customer. That time is past. Now, companies must institutionalize customer intelligence so that all divisions share a collective understanding of interests, needs, history, and value—real and potential. The result of this shared, cross-divisional intelligence ensures that all customer interactions are smooth, supportive, and will engage, and ideally propel a decision forward. Corporate interactions must create a linear continuum to compensate. Another important outcome from a new understanding of customer behavior is the opportunity for companies to align processes. When companies understand the significance of interactions, they can refine content, support decisions, and smooth communications. This same understanding supports cost containment, as efficiency is examined as part of this effort. Key resource risks are identified, technology gaps are filled, and steps are rationalized. The results relieve customers of heavy lifting, and frees resources to contribute their greatest value. Technology has changed everything about how we marketers do our jobs. The big data floodgates are wide open, and the availability of high-velocity, robust data represents real opportunity and competitive advantage for companies that are willing to move past the static façade and past being in a phase of perpetual customer acquisition. The real richness from big data is realized when customer behavior becomes meaningful, and companies organize both intelligence and process to optimize the return from those relationships. What do you think? How have your marketing strategies and tactics changed in the past year or so as a result of big data? What challenges have you experienced? This article was published on Broadsuite Media Group Blog.